Published: Nov. 3, 2018 at 04:40 p.m. Updated: Nov. 4, 2018 at 02:44 a.m. In the game of football, statistical division of credit is often an impractical task given the dynamic nature of any given play. Using Next Gen Stats player tracking technology, we have developed metrics to move beyond traditional box score statistics and derive insights to improve our analysis of individual player performance. This week, we are introducing another new metric for the 2018 season, Expected Yards After Catch, to contextualize passing plays from the receiver's perspective. The machine learning model estimates how many yards should a receiver gain after the moment of reception, based on the factors of the play? The purpose of the model is not to perfectly predict yards after the catch, but rather to set expectations driven by the dynamic factors of the play. Traditionally, Yards After Catch (YAC) is measured by taking the difference between the yards gained and the air yards of a completed pass. In other words, how many yards did the receiver create after the catch was made? Without context, YAC suffers from similar deficiencies as Completion Percentage -- yards gained after the catch is often a product of the dynamics of the play rather than an all-encompassing measure of a receiver's elusiveness. For example, a receiver with more blockers than defenders in their path should be expected to gain more yards after the catch than if there are more defenders than blockers. This is just one of the many pieces of context that inform our Expected Yards After Catch model. 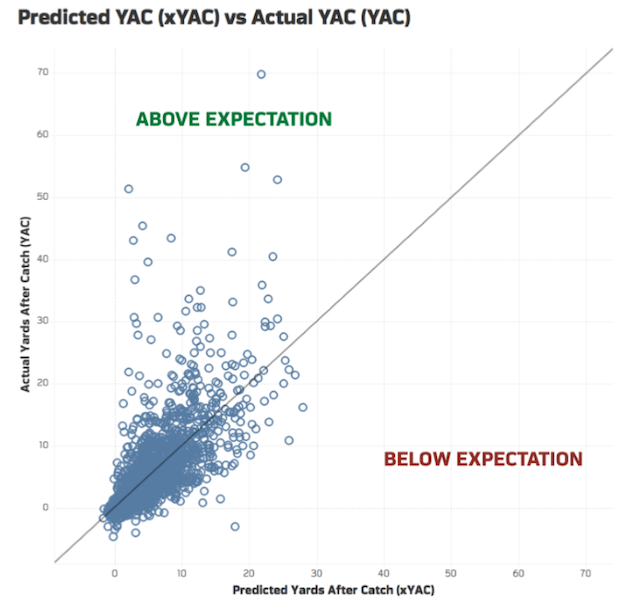 Expected Yards After Catch (xYAC) leverages Next Gen Stats player tracking data to differentiate between a receiver's actual yards gained after the catch and their expectations at the moment of the catch. Similar to our Completion Probability model, the xYAC model takes into account several in-play factors such as the speed, direction, and acceleration of the receiver, the distance between the receiver and the nearest defender, the number of defenders in the path of the receiver, the number of blockers in the path of the receiver, among several other metrics. The first step to predicting Yards After Catch is to estimate how many yards a receiver should gain before a defender closes within one yard (i.e. Yards Gained Before Close-In). We find a strong relationship between actual yards after catch and actual yards gained before close-in from our training set (r-squared = 0.64). The relationship between yards after close-in and yards after catch aligns with conventional wisdom--a defender closing-in is a reliable proxy for tackle opportunity. If we can predict how many yards a receiver will gain before a defender closes-in, we can improve our prediction of how many yards the receiver should gain after the catch. 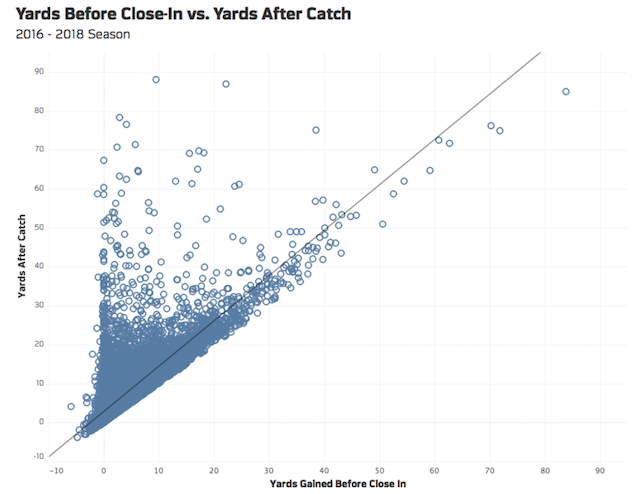 To this end, Expected Yards Gained Before Close-In is used as an input to predict Expected Yards After Catch and is one of the main drivers in the model. Other features of the play are driven by the concept of open space. 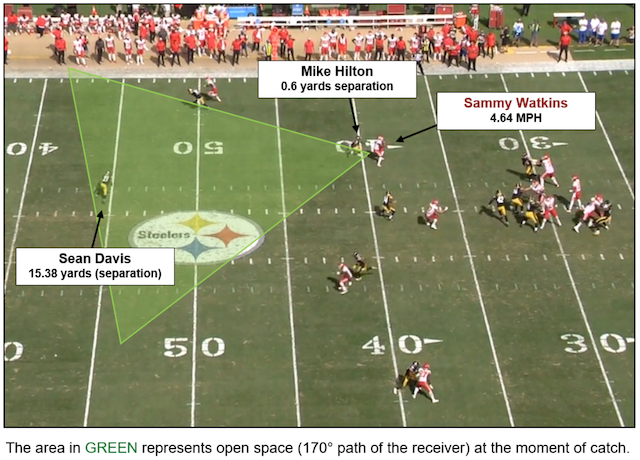 Using player tracking technology, open space refers to the area in the possible path of the receiver, accounting for the number of defenders and teammates, as well as each of their speeds, accelerations and directions at the moment of catch. Open Space on a given reception is determined by a 170° cone in front of the the receiver at the moment of catch, and will not include paths back towards the original line of scrimmage or out of bounds. 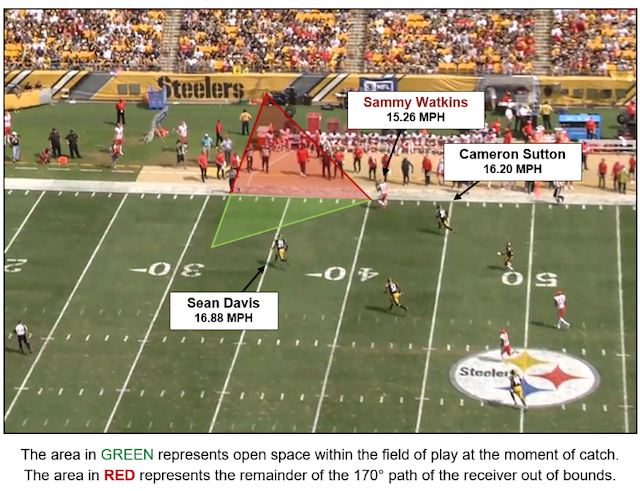 To best illustrate the drivers of our Expected Yards After Catch model, we dive into two plays from Sammy Watkins in the Chiefs 42-37 win against the Steelers in Week 2. Watkins gained 21 yards after catch on both plays, but was in dramatically different situations at the moment of the catch, leading to different expectations (xYAC). On the first play, Watkins was expected to gain 21 YAC and on the second play, Watkins was expected to gain only 7 YAC. We break down both plays to better understand the differences between expectations. On 1st & 10 from their own 40-yard line in the first quarter, Patrick Mahomes found Watkins for a 40-yard gain. Watkins gained 21 yards after the catch which was exactly amount he was expected to gain once he received the ball according to our model. The snapshot of the play at the moment of catch can help us understand how xYAC = 21 is calculated. The two nearest defenders at the moment of catch, Cameron Sutton (5.3 yards away) and Sean Davis (10.4 yards away) are outside of Sammy Watkins' open space 170° angle. Since Watkins is traveling 15.26 MPH, Sutton 16.20 MPH and Davis 16.88 MPH, Watkins has the time and space to create yards in the open field before either defender closes-in. Watkins gains 21 yards after the catch on the play and [according to the model] was expected to gain 21 yards after catch. In the same game, later in the third quarter from a similar position on the field, Mahomes once again connected with Watkins, this time for a 25-yard gain. Watkins was expected to gain just 7 yards after the catch, but on this play gained 21 after the catch. The moment Watkins makes the catch, Mike Hilton and Sean Davis are the two defenders in open space. Since Hilton is just 0.6 yards away, Hilton is the most likely defender to make the play. If Watkins gets away from Hilton, Sean Davis is the next most likely defender to make the tackle. Watkins eludes both defenders on the play, gaining 21 yards after catch when he was expected to gain just 7 yards after catch according to the model. Watkins gains the same amount of yards after catch on both plays in two drastically different situations. Our Expected Yards After Catch model allows us to gain insight into the elusiveness of a receiver after the catch by adapting to the in-play data of any situation. On an aggregate level, YAC and xYAC can be transformed to evaluate how many yards a receiver gains above or below expectation across a sample of plays -- YAC Above Expectation (or xYAC +/-). Another derivative of the model -- YAC Success Rate -- controls for outliers and measures whether the receiver gained more or less than expectation on a per-play basis. In a future article, we will dive deeper into these metrics to evaluate the best receivers after the catch in the NFL. The Expected Yards After Catch model is trained and tested using all completions from the 2016 and 2017 regular season and postseason. The model is validated against a random sampling of 10% of the data (1,962 plays). Using only data not included in the model, we find the relationship between Actual Yards After Catch and Predicted Yards After Catch is strong (Spearman coefficient = 0.81). 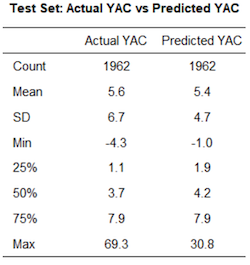 We also find the model predictions are generally conservative; the range of predicted YAC outcomes has less variance than actual YAC outcomes. The results of our validated test set shows the maximum actual YAC is 69.3, while the maximum predicted YAC is 30.8. This is a desired result, as a player should almost never be expected to gain 60 yards after the catch. When a receiver does gain 60 yards after the catch -- significantly higher than expectation -- the receiver must have made an exceptional play. Likewise, the minimum actual YAC is -4.3, while the minimum predicted YAC is -1.0. This also aligns with conventional wisdom--a player should not be expected to gain -4 yards after the catch. Expected Yards After Catch is intended to isolate a receiver's ability to create yards after catch relative to the expectations of the average NFL player. We can improve our methods of statistical division of credit by isolating the factors within the control of the play with the help of Next Gen Stats player tracking data.